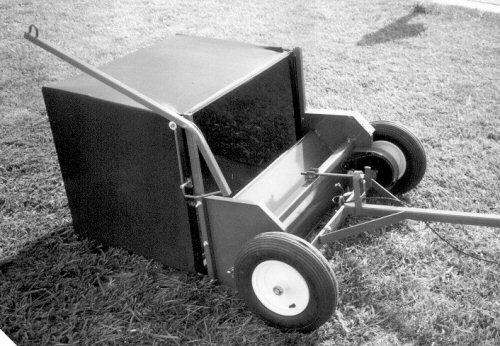 The model 136 Estate Turf Groom Sweeper is a heavy duty tow behind sweeper, designed to be towed behind an ATV, garden tractor, commercial mower, turf truck, or tractor. Pneumatic wheels on 8" rims provide the driving power for the high speed brush that turns at approximately 1500 rpm when the sweeper is towed at mowing speeds. 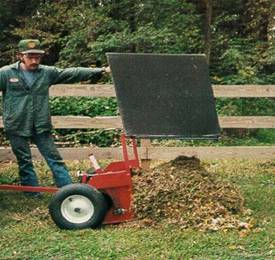 The brush has the power to pick up leaves, pine needles, wet or dry grass clippings, and other similar debris. 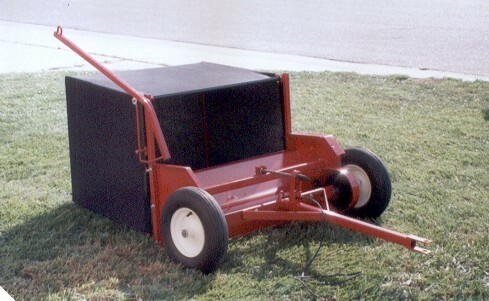 The free discharge at mowing speeds will go 3 to 4 feet high, which insures complete bag fill. The model 136 was designed to be more heavy duty than many similar sweepers of this type that are currently available. 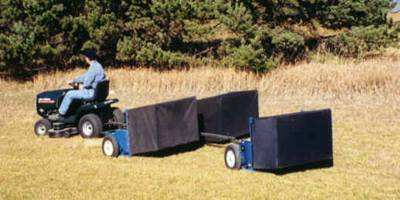 The model 136 has been designed for use at golf courses, schools, athletic fields, parks, large estates, and large recreational areas. Sweeps a 36" wide path quickly, and is a great alternative to large tractor sweepers that only windrow the material, and can be used to pick up windrowed material from a large tractor mounted sweeper. 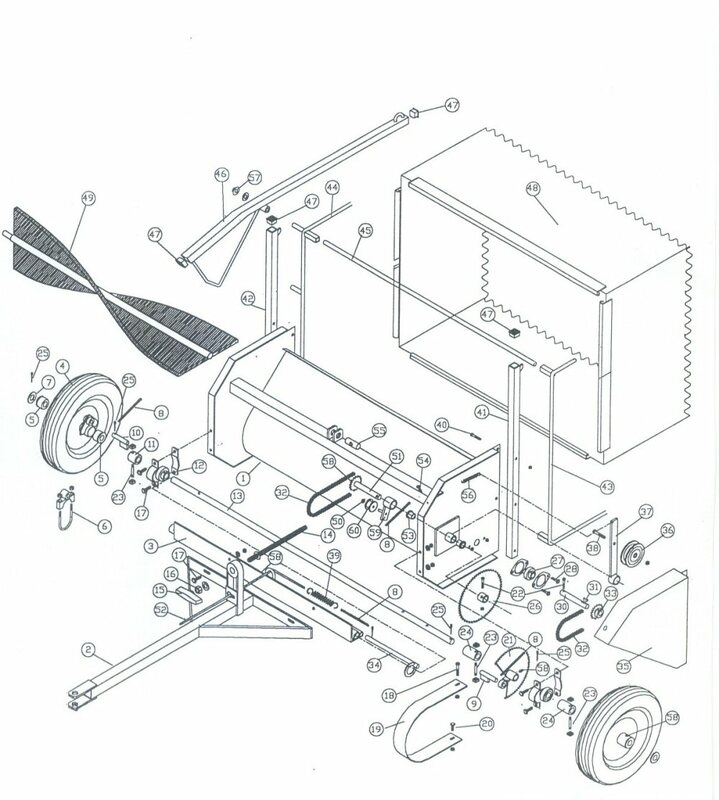 The model 136 is also a lower cost alternative to engine driven grass collection systems on mowers. Color is blue, shipping weight approximately 190 lbs. This Hitch Will Pull 3 Sweepers Hitch Together. Price Is $249.95 Plus Shipping. The Model 136 Is A Special Order Item Please Allow 21 Days For Delivery. Many items can be delivered sooner, but no cancellations or delivery refusals will be accepted on orders delivered within the 21 working days from your placing of the order. All "shipping charges" refer to standard shipping charges where delivery is to a commercial / business location where if delivery is by common carrier (truck) they will deliver the freight to the delivery address, and you must have a way to unload it. 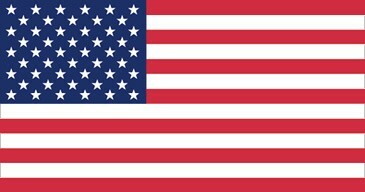 If you don't have a way to unload it, and you don't have personnel to unload the freight by hand, and services such as a lift gate are required, a minimum extra charge of $75.00 will apply, but this charge varies for each terminal location, so this would be the minimum and could be as high as $180.00. Standard delivery for truck shipments means to your dock or door. If the item needs to be placed inside your warehouse by the trucking company, there will also be an inside delivery charge. If the shipment is delivered to a non commercial, or residential address you may choose to pick up at the Freight Company's Terminal, in most cases this saves on additional shipping charges. Any special services should be requested at the time of the order. If you have any questions about delivery, please contact us at (800) 872 - 8864.